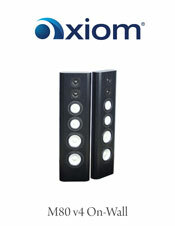 Axiom's M80 floorstanding speaker is designed for the audiophile who wants both precision and high SPL (Sound Pressure Level). The M80 is now available in an on-wall version. On-walls are becoming very popular as they take almost no space in your room but maintain the advantages of the full sized version when used with a subwoofer. The M80s, show off the best of what over 30 years of audio research has proven - you will be blown away by the clarity, detail, and stunning dynamics this speaker will add to your listening experience. It has unprecedented tonal range, all in perfect balance: from deep low bass, clear open midrange and extended nuanced treble. You'll hear the click of the castanets, the tinkle of the triangle, and the soul-stirring reverberations of the big bass drums. Dual woofers, dual midranges and twin tweeters - hear it all! That's 6 drivers in each M80 speaker - 12 in a pair - for spectacular power handling up to 400 Watts (800 watts peak) and deep extended bass. From the tight snap of a bass drum to the shimmer of brushed cymbals, the accuracy of this speaker will astound you. The M80 transforms musical recordings into live performances in your living room, and brings definitive realism to home theater. These 4-ohm audiophile speakers will create ultra-clean, high-volume levels in large rooms. The on-wall version comes with our easy-to-install Power Bracket that allows you to wire the bracket and the speaker makes the connection when you hang it on the bracket. A plethora of custom finishes are available in Customize Yours.